This simple celebration of spring is a versatile idea that can be readily adapted to suit available ingredients. Until he retired in 1996, famed Swiss Chef Fredy Girardet ran a Michelin 3 star restaurant in Crissier. His first book, Cuisine Spontanee was published in 1982. It is only in recent years that he’s released the second! Girardet is noted for his light but detailed touch. Some recipes have been described as “daunting in their detail” but even though the instructions are explicit and detailed, they leave little room for error. The recipes in Cuisine Spontanee are achievable and the results exceptional. Girardet’s original features grilled scallops, langoustines and asparagus. Sweet, new season’s scallops and asparagus are now in the shops but exotic crustaceans might be harder to find for those outside large centres. Frozen green King prawns are a more than fair substitute, but if you do have access to Moreton Bay bugs, baby marron or their kin do take advantage. Pat the prepared scallops and prawns dry with paper towel. Season well with salt and pepper. Cook the asparagus in simmering water, lid off, until just tender – about 4 minutes. Drain, refresh under cold water and pat dry. Do this at the last minute so the spears are still warm. Put the lemon juice, pepper and salt to taste in a small saucepan. Whisk in the olive oil and warm the vinaigrette through. Add the dill. Keep just warm. Meanwhile heat a very thin film of olive oil in a non-stick fry pan and cook the scallops and prawns over high heat for about a minute, turning once. They should be nicely coloured and just cooked through. To serve: Arrange the asparagus on a serving plate. 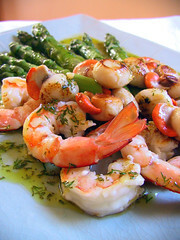 Pop the prawns and scallops to one end and pour the warm dill vinaigrette all over. Serve at once.